Home Design Ideas You Don’T Want To Miss! There’s a huge number of homeowners out there looking to keep their homes trendy, relevant, and inviting inside. Interior design is an economic driving force because it’s ever-changing and at the forefront of entertainment these days (think: HGTV, the Gaines family, Property Brothers, etc.). The more natural hues and the strong the connection between your indoor/outdoor space you can foster, the better. This means a lot of homeowners will need to address the placement and size of their current windows and consider a windows replacement project in the near future. Have you ever heard the term “authenticism?” This word—often used in the interior design industry—refers to the act of embracing natural textures and colours. For example, the “farmhouse” and “coastal” home styles fall into this category—they’re both all about embracing outdoor shades and qualities and incorporating them into the home. Gaudy hardware on your kitchen cabinets: is there anything more packed with personality than a perfectly in-order kitchen with WILD drawer pulls and cabinet knobs? So fun! Fuzzy throws and shaggy rugs: we are a culture of comfort-seekers. Why not find yourself an asymmetric rug with a log shag to it to cushion your feet and add texture to your space? This look has actually been in for quite a few years and is easily replaced in 5-10 years, when the trends shift again. If you’re looking to breathe new life into your new windows Brampton, Ontario, we’d love to help! 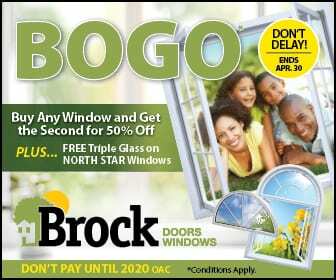 If the time has come to replace your windows and/or doors—give our experts here at Brock Doors and Windows a call!